Over the last 20 years, a revolution has taken place in English-language dictionary-making. Now this revolution has been carried over into dictionaries for the African languages and Oxford University Press Southern Africa has published the ground-breaking results. The revolution in English-language lexicography has been the use of corpora: vast databases of real text, gathered from novels, newspapers, government documents, and recorded speech, that can be analysed and searched electronically, a bit like the Internet. Making a dictionary using a corpus or corpora means that a dictionary-maker can do two very important things: they can identify how often a particular word is used by the users of that language, and they can see how they use it. Knowing how often a word is used helps lexicographers decide whether to include it in the dictionary they are making. If a word is very frequently used, it should probably be in a dictionary for school children. But if it is seldom used, it should probably only be in a dictionary designed for adults, who read more widely and may therefore encounter rare words. Knowing how people use a particular word is also of critical importance to lexicographers. It means they can include examples of how words are really used, showing less-confident users of the language how to use it correctly. Almost all good dictionaries in English are now based on research in corpora, but this hasn't been the case with dictionaries for African languages. Deciding to remedy this, Oxford University Press Southern Africa has been working with a team of experts over the last two and a half years to develop the first dictionary for an African language to be based on a corpus. The team included mother-tongue speakers of English and Northern Sotho, as well as experts in dictionary-making, and was led by Dr Gilles-Maurice de Schryver, Extraordinary Professor in the Xhosa Dept at the University of the Western Cape and an Assistant Professor of African Languages and Cultures at the University of Ghent in Belgium. The team was also supported by language engineers, and used TshwaneLex, state-of-the-art dictionary compilation software developed in South Africa by David Joffe of TshwaneDJe. 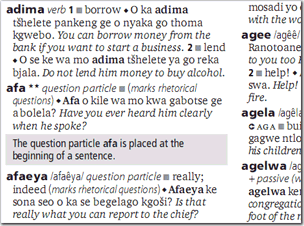 "The most exciting thing about this new dictionary for Northern Sotho is that it includes example sentences in both English and Northern Sotho – a first for an African language dictionary! Our research has shown that teachers value these example sentences very highly – they can really help children improve their speaking and writing skills," says publisher Megan Hall. Mamokgabo Mogodi, the main compiler for the Northern Sotho side, explains how she worked: "For each word in the dictionary, I first studied hundreds of lines of text from the corpus. From this I saw how a word was really used and I could work out the different meanings it could have. For each meaning I then selected an authentic example sentence. For the first time I have seen how my own language, Northern Sotho, is actually used." This dictionary is also the first for Northern Sotho to focus on the needs of learners at school, whether they are learning English, or learning Northern Sotho. So it includes about 300 key words from the school curriculum (with bilingual definitions), a guide to pronunciation, a specially written mini-grammar, sample emails and letters – and help with writing SMSs. It really does support the Dept of Education's language policy encouraging bilingualism. Managing Director of Oxford University Press Southern Africa, Lieze Kotze, says, "We are very excited to have published a dictionary that is so accessible and easy to use -- despite being the first of its kind -- and to have supported learners of English and Northern Sotho in this way." Mengwageng ye 20 ya go feta, go bile le phetogo ye kgolo kudu ka go tlhamo-pukuntšu polelong ya Seisimane. Gabjale phetogo ye kgolo ye, e fetišeditšwe go dipukuntšu tša dipolelo tša Seafrika gomme Oxford University Press ya Borwa bja Afrika e phatlaladitše dipoelo tša makgoraditsela. Phetogo ka go tlhamo-pukuntšu polelong ya Seisimane e be e le tirišo ya dikhophase: sešego se segolo sa mantšu a kgonthe, ao a kgobokeditšwego go tšwa go dipadi, dikuranta, ditokomane tša mmušo, le dipolelo tše di gatišitšwego, tšeo di ka sekasekwago le go nyakollwa ka mokgwa wa elektroniki, bjalo ka Inthanete. Go hlama pukuntšu ka go diriša khophase goba dikhophase go ra gore mohlami wa pukuntšu a ka dira dilo tše pedi tše bohlokwa kudu: a ka šupa gore lentšu le le rilego le šomišwa gakaakang ke bašomiši ba polelo yeo, gape a ka bona gore le šomišwa bjang. Go tseba gore lentšu le šomišwa gakaakang go thuša bahlami ba pukuntšu go kgetha ge eba ba ka akaretša lentšu leo ka gare ga pukuntšu yeo ba e hlamago. Ge eba lentšu le šomišwa gantši kudu, le swanetše go ba ka gare ga pukuntšu ya bana ba sekolo. Eupša ge eba ga le šomišwe kgafetšakgafetša, gona le swanetše go ba ka gare ga pukuntšu yeo e beakanyeditšwego batho ba bagolo, bao ba balago ka go tsenelela ka gona ba ka kopanago le mantšu ao e sego a tlwaelo. Go tseba ka moo batho ba šomišago lentšu le le rilego go tloga go le bohlokwa kudu go bahlami ba pukuntšu. Go ra gore ba ka kgona go akaretša mehlala ya ka moo lentšu le šomišwago ka gona, go laetša bašomiši ba polelo bao ba hlokago boitshepo ka moo ba ka šomišago lentšu leo gabotse ka gona. Bontši bja dipukuntšu tša go loka tša Seisimane gabjale di theilwe godimo ga nyakišišo ka go dikhophase, eupša ga se go be bjalo ka dipukuntšu tša dipolelo tša Seafrika. Go kgona se, Oxford University Press ya Borwa bja Afrika e šomile le sehlopha sa ditsebi mengwageng ye mebedi le seripa ya go feta go godiša pukuntšu ya mathomo ya polelo ya Seafrika ye e theilwego godimo ga khophase. Sehlopha se akaretša bao ba bolelago Seisimane le ba go bolela Sesotho sa Leboa bjalo ka polelo ya ka gae, mmogo le ditsebi ka go tlhamo ya pukuntšu bao ba etilwego pele ke Ngaka Gilles-Maurice de Schryver, Profesa ya go ikgetha ka Lefapheng la Sethosa Yunibesithing ya Kapabodikela, gape e le Mothušaprofesa wa Dipolelo le Ditšo tša Seafrika Yunibesithing ya Ghent go la Belgium. Sehlopha se be se thekgwa gape le ke dientšenere tša polelo, gape se šomiša TshwaneLex, lenaneo la boemo bja godimodimo la go hlama pukuntšu leo le tšweleditšwego ka Afrika-Borwa ke David Joffe wa TshwaneDJe. “Seo se kgahlišago kudu go fetiša ka pukuntšu ye ye mpsha ya Sesotho sa Leboa ke gore, e akaretša mafoko a mehlala ka Seisimane le Sesotho sa Leboa — seo e lego la mathomo se dirwa pukuntšung ya polelo ya Seafrika! Nyakišišo ya rena e laeditše gore barutiši ba tšea mafoko a a mehlala go ba a mohola kudu — a thuša kudu bana go kaonafatša mabokgoni a bona a go bolela le go ngwala,” gwa realo mophatlalatši Megan Hall. Mamokgabo Mogodi, mmeakanyimogolo wa lehlakore la Sesotho sa Leboa, o hlaloša ka fao a šomilego ka gona: “Go lentšu le lengwe le le lengwe ka pukuntšung, ke thomile ka bala makgolo a methaladi ya sengwalo go tšwa go khophase. Mo, ke kgonne go bona ka fao lentšu le šomišitšwego ka gona gomme ka kgona go hwetša ditlhalošo tša go fapana tšeo le ka bago natšo. Go tlhalošo ye nngwe le ye nngwe, ke kgethile lefoko la nnete la mohlala. E bile gona ke lemogago ka moo polelo ya gešo, Sesotho sa Leboa, e dirišwago ka gona”. Pukuntšu ye gape ke ya mathomo ya Sesotho sa Leboa go bea šedi ya yona go dinyakwa tša baithuti sekolong, ba ka ba ba ithuta Seisimane goba ba ithuta Sesotho sa Leboa. Ka gona e akaretša mantšu a motheo a 300 go tšwa go kharikhulamo ya sekolo (ka ditlhalošišo tše polelopedi), tlhahlo ya kwagatšo (ka moo mantšu a bolelwago ka gona), popopolelo ye kopana ye e ngwadilwego ya go ikgetha, mohlala wa die-meile le mangwalo — gape e thuša ka go ngwala diSMS. E tloga e thekga pholisi ya Kgoro ya Thuto ya go hlohleletša go tseba goba go bolela dipolelo tše pedi.